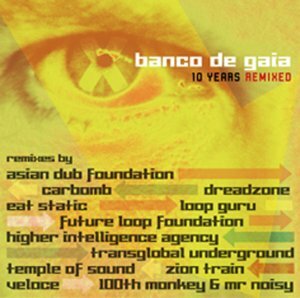 10 Years Remixed was a limited edition release created following the success of the previous year’s debut Banco de Gaia compilation 10 Years. It began as a conversation between friends and evolved into a collection of remixes. This is a deeply personal document with every remix being commissioned by Banco himself and every remix with the exception of one mix being borne out of a long term relationship. In a super reactionary and totally cynical music industry how do you express your joy at what you do? After struggling to re-acquire his master tapes, how do you throw a sonic party? In this instance Banco de Gaia called his friends and the result is 10 Years Remixed, a beautiful collection of mighty fine exclusive remixes. 10 Years Remixed is the final statement at the end of an exhausting journey. You might call it closure. As an artist you are not supposed to cherish your own work or worry about who has the intellectual copyright, however for Banco de Gaia these issues are key. Disco Gecko was founded to put the music back out there. Regardless even of how it is perceived for an artist to ‘trade’ on their back catalogue. To quote John Lyndon of PIL ‘anger is an energy’ and channeled in the right way it’s amazing what can be achieved. 10 Years Remixed is the home coming parade and two fingers up to the men in suits, lawyers and chancers who stood in the way of the music. 10 Years Remixed is a party and it’s time to get down.